Located in Jerusalem, the Al-Aqsa Mosque sits on land that is associated with miracles involving both Muhammad and Abraham. It is therefore regarded as holy land to both Muslims and Jews.AFP/Getty Images. The Al-Aqsa Mosque is the most holy site for Muslims in Jerusalem and one of the most holy of places for all Islam. Its origin relates to a famous supernatural event in Muhammad’s life, the so-called Night Journey or Al-Isra wa Al-Miraj. One evening he was visited by the angel Gabriel (from whom he was receiving the Qur’an). He led Muhammad to a spirit horse (buraq), which carried him to Jerusalem. Here he met, among others, Abraham, Moses, and Jesus. In their presence, he offered a prayer to Allah. While in the city, he had three dishes placed in front of him that contained, respectively, water, wine, and milk. Muhammad refused the water, knowing that if he chose it the Muslims would drown, and he declined the wine as it would mean Islam would leave the true path. He instead chose the milk, indicating the Muslim community would follow Allah’s true religion. Gabriel confirmed his choice. Muhammad next visited heaven, where he met and talked with Allah before returning to Mecca. The meeting with the prophets, the prayer, and the drinking of milk are all believed to have occurred on Temple Mount in Jerusalem at the spot currently occupied by the Al-Aqsa Mosque. Muhammad’s presence in this place is further confirmed by the hoof print his horse left in a rock as it lifted Muhammad to heaven. Additionally, some believe the rock attempted to go to heaven with Muhammad and was pushed back into place by Gabriel, who left a handprint in it. 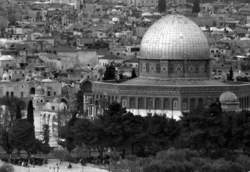 Following the capture of Jerusalem by the Caliph Omar in 638 CE, attention was immediately focused on the Temple Mount. The first spot marked by a building was the rock from which Muhammad was believed to have been lifted to heaven. That same rock, in the center of what is known as the Dome of the Rock, is also believed to be the axis of the world, the spot from which creation began and at which the final trumpet, ending history as we know it, will sound. The original building on the site where Muhammad offered prayer was completed by Omar soon after the Dome of the Rock was dedicated. It was then rebuilt in the eighth century by the Caliph El-Walid. Muslim presence in Jerusalem grew slowly, and in the eleventh century the Muslim rulers decided to Islamize the city by pushing the Christians out. In the process, a number of Christian churches were destroyed. Christian crusaders took thecity in 1099, and those Muslims who survived the attacks were sold into slavery. Muslims were largely denied access to the Temple Mount until 1187, when Saladin (1138–1193) retook the city. Jerusalem then remained in Muslim hands (except for a few years in the thirteenth century) until 1917, when the British took control. The Temple Mount is now surrounded by a wall that predates Muslim presence in the city but essentially marks its most sacred area. This area of the city is off-limits to non-Muslims on Fridays and major Muslim holidays. The major conflict is with Jewish believers who believe the rock in the center of the Dome of the Rock is the place where Abraham bound Isaac and prepared to sacrifice him (Genesis 22). The major Christian sites are close by, but outside the wall. Cragg, Kenneth. The Dome and the Rock, Jerusalem Studies in Islam. London: SPCK, 1964. Graber, Oleg. The Shape of the Holy: Early Islamic Jerusalem. Princeton, NJ: Princeton University Press, 1996. Landay, Jerry M., and the Editors of the Newsweek Book Division. The Dome of the Rock. New York: Newsweek, 1976.